China is amazing. We had such a great day. 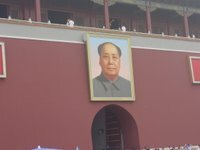 We started with a tour of Tian’an Men Square and the Forbidden City. 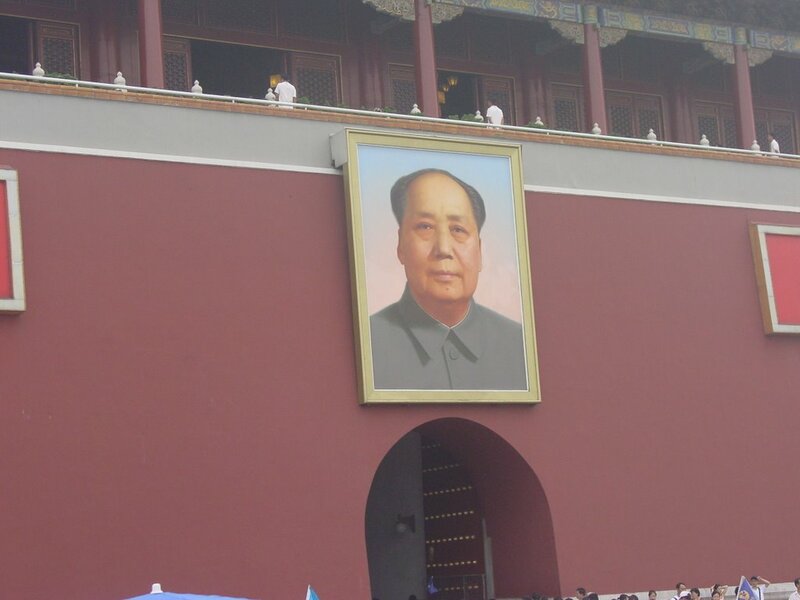 Tian’an Men Square holds Chairman Mao’s mausoleum and is surrounded by the Great Hall of the People and China National Museum. Across the street is the entrance to the Forbidden City. The Forbidden City is comprised of 9,999 ½ buildings. The reason behind this odd number is the believe that God has 10,000 building in heaven so any earthly king should have ½ less. The vastness of the Forbidden City is breathtaking. The detail in the carvings and ornate paintings were remarkable. The corner of the roof of each building had numerous animal carvings, the more important the building, the more mythical animals. It was extremely hot today. The humidity seemed much worse than at home, something I did not think was possible. We were the recipients of many stares. One family pulled Katie aside and took a picture of her with their children. Katie was a trooper. She cooperated without even a dirty look. Katie has really been amazing. It is hot, we are constantly busy and facing a totally new culture and she has been so mature and easy going. She is a huge help with the two families with younger children, she is able to keep the children amused. The street peddlers were something else. They came right into your space and tried to sell us things; many following us even though we said no. This happened yesterday at the airport with our luggage. One woman grabbed my luggage right from me and wheeled it to the bus. I gave her $1 and she wanted more. She followed me despite the fact that I was shaking my head and saying no more. 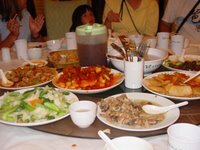 After the tour of the Forbidden City we went to a Dai Restaurant. Dai are a minority people in Southern China and look to be related to the Thai/ Vietnamese/ Laotian. 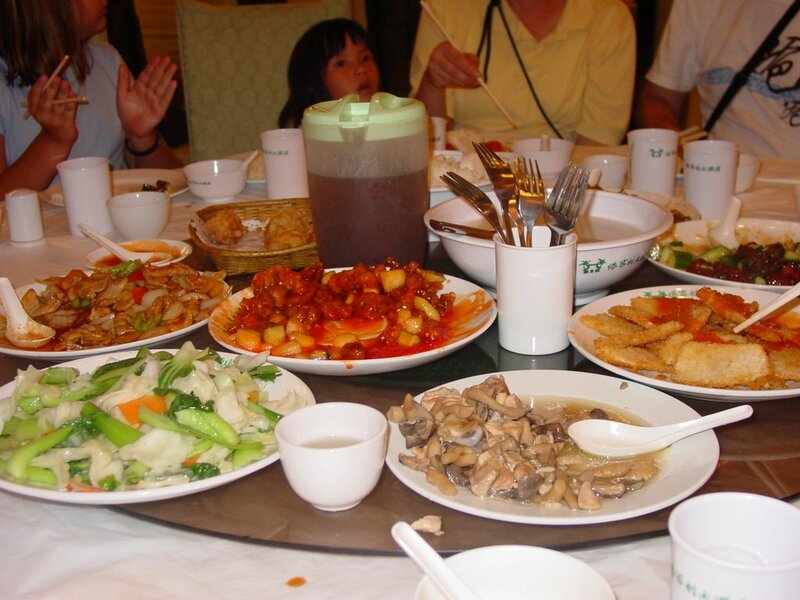 The food was served on lazy Susan and each dish was fabulous. Women were also dancing through the lunch. We then headed to the Temple of Heaven. This is the place were the emperors would pray and perform ceremonies to ensure a good harvest. Once again the buildings were quite big and ornately designed. There was a very pleasant breeze. We walked through a park and saw locals playing cards, singing, and doing a Qi-Gung type energy exercise. We also visited a silk market and watched how they make silk blankets and coverings. We had a chance to stretch the silk ourselves. We were very close to buying a silk comforter. It is so soft and comfortable. The hotel has one so we are getting spoiled. The night was finished off with an amazing performance, Chun Yi- The Legend of Kung Fu. This told the story of a young boy as he joined the Shaolin Temple and became a warrior monk. The show was used Wu Shu (martial arts) to illustrate this story. They were top-notched athletes. While we were typing this we were watching TV and this same show was playing! Our guide, Tony (his American name) is fabulous. He takes time to explain the sites we are seeing and tells us very interesting facts. He is very funny and down to earth. He taught us a little Mandarin today and sang an American song (You are my Sunshine) for us. The told us this is a song he enjoys singing to his 16 month old son. The storms that are hitting China are south of where we are now and north of where we will be so they won’t cause us any problems. We are exhausted after a wonderfully long day of touring. We hardly know what to say except we are soooooo happy that you are having this marvelous experience and that you are sharing it with us as well. We are not really surprised that Katie is such a trooper... we know what a good heart she is... but we are proud if her just the same. Keep on enjoying and we look forward to your next posting. Of course, I looked at the food in detail. It looks wonderful. 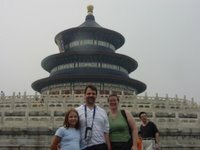 China has always been on my list of places I would love to travel. It must be such a wonderful experience traveling to a beautiful country to bring home your daughter! Sophia is lucky that you are keeping such a detailed and interesting record of her adoption. I am making sure I check my computer daily. I know Mom wants to write to you too.